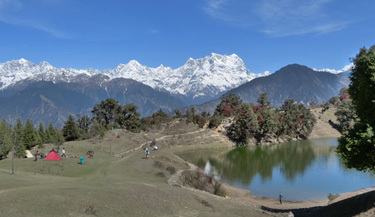 Panwali Kantha is a nice trek route that remains with different beauties in various seasons. Excellent flowery view is there in the winters, while the extraordinary panoramic snow white beauty can be experienced in the winters. Since the altitude of the place is not that much, it is going to give you a perfect experience for the next treks. Excellent green grasses and meadows of alpine and deodar are there for you in the monsoon, whereas the hilly surface laments itself with snow envelop in winter to give your eyes a different type of pleasure. This is the trek spot, where routes are not definite. You can reach the place from Ghuttu and from Sonprayag too. If you start it from Ghuttu, the route will end at Triyugi Narayan. However, excessive snowfall in the route during winter indicates to avoid this route for that time. 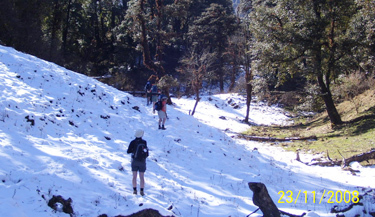 The trek route is a short one and you will not have to prepare yourself so essentially, if the snow layer is average. There is need to plan a second way. Heavy snow fall can block the routes at any time; a contingency plan can be called into action at times. The valley region is having excellent flowery show for you with reddish and pinkish rhododendrons, blooming at all sides. April and May are two ideal months, where the flowery show can be seen, just after the snow layer melts down, washing the valley with fresh mineral water. The superb view of the Greater Himalayan peaks is a bonus gift from nature for you. In fact, a part of this route is to be covered, while trekking from Gangotri to Kedarnath. The complete view of Kedarnath, Badrinath and even Gangotri with Yamunotri in this trek route will generate a feeling in your heart that nature is showing her best four kids. Snow peaks of Thalay Sagar, Kirti Stambh, Kedar Dome, Neelkanth and Meru peeps behind the four best children, saying you that the full family is there, awaiting to pay you their homage. In the monsoon, you will find the lush Bugyals, excellently green. The greenery is so prominent in the hue that you will feel that no other colors are reaching your eyes. Birds and multiple colored flowers are ready to make the environment even more charming and enthusiastic. The distant white peaks under the blue sky will seem to you as a picture drawn by your favorite artist over the canvas. From April to November, the trek becomes a little more challenging with snow covering the ridges in Kyunkhola pass. From June to September, winter trek at the route is best. Fauna in the land is also great. You must have to be lucky to find the regular habitats of the place. Himalayan Bears, Ghoral and Rare-musk deer are the most renowned among them. You will listen from the local people that the land is the wedding place of Lord Shiva and Devi Parvati. Looking at the outside solace, you will not be able to deny that in your mind even. 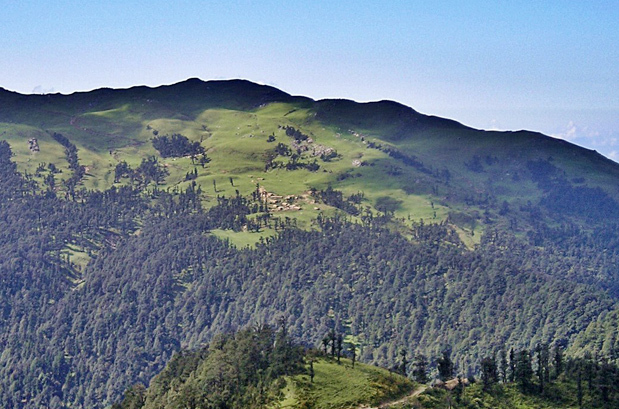 Ramble over the velvety Panwali Kantha meadows and explore the flora of the region. Make your way to the camping site through the dense forests of flowering rhododendrons. 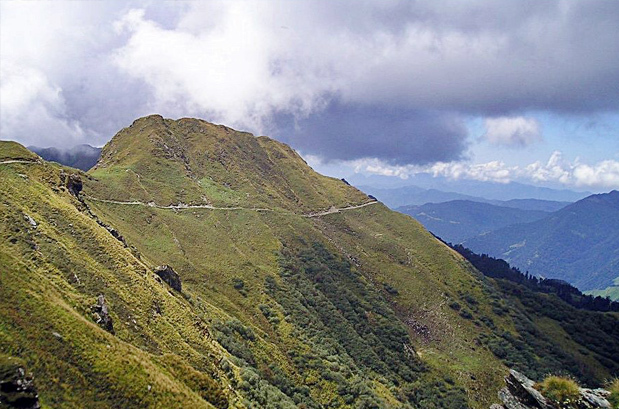 Best time to travel to Panwali Kantha Trek is in summers (May – June) and Post Monsoon (September – mid October). 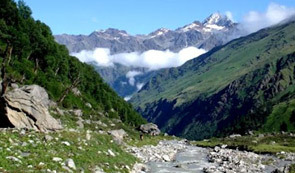 Summer: The weather of Panwali Kantha Trek remains salubrious and pleasing during summers. The Himalayas are distinctly visible and the cool breeze adds charm to the vacation. Carry woolens with you. Post Monsoon: Serenity and solitude are at its best during post monsoon at Panwali Kantha Trek. The region is blessed with snowfall during winters and the accommodation options also remain few. But you can see the best of Panwali Kantha Trek during post monsoon as it looks like Heaven on earth. Where is the Panwali Kantha? 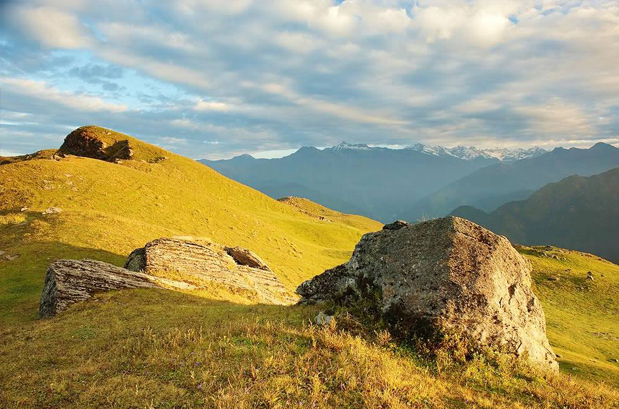 One of the most expansive alpine meadows of Garhwal Himalayas, Panwali Kantha is known for its variety of flowering herbs, wildlife, and scenic landscape views. 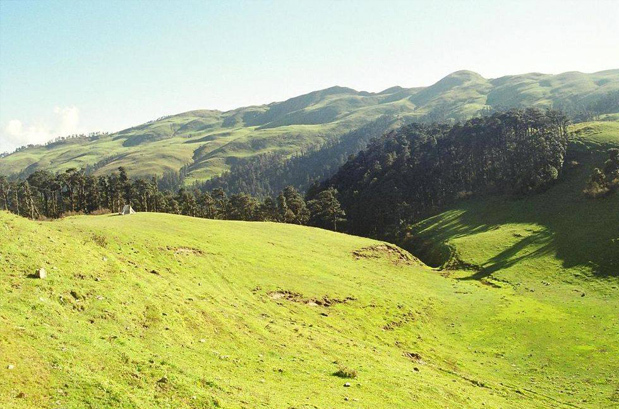 The meadow is at an elevation of 10827 ft, right between Mandakini & Bhilangana rivers and the Himalayan zone of Tehri & Rudraprayag district of Uttrakhand. High altitude animals like Bharal, Ghoral, Himalayan Bear, and the rare musk deer are also spotted here. By Airways: Jolly Grant is the nearest airport, around 160 km from Ghuttu. By Railway: Haridwar Railway Station, 145 km from Ghuttu, is the nearest railway station. By Road: Taxis and buses (both public and private) are available from Rishikesh (186 km), Haridwar (206 km), and Dehradun (225 km). In the morning catch AC train for Haridwar at 06:50 hrs. Arrival at Haridwar by 11:25 hrs, here meet our guide and transfer to Rishikesh by road. On arrival check in to hotel. The day is for relaxed. By evening one can walk nearby places. Overnight stay at hotel. In the morning, we will drive to Ghuttu, which is a small Garhwal village also the starting point of the trek. We will drive through the forest and beautiful villages. We will stop to have lunch. En route we shall also view Tehri Dam and lake. On arrival in Ghuttu, we shall stay for meal and overnight camping. Today, we shall start our trek for Panwali. It will be a steep trek and would require walking for about nine kilometers. On arrival in Panwali, we shall camp in the meadow near a stream. Meals and overnight stay in the camp. After the breakfast today, we will start descending towards Magguchatti. Our trek today will require of us to walk on rocky terrain. Arrive in Magguchatti and camp. Meals and overnight stay in the camp. Post breakfast, we shall trek to Trijuginarayan, which is believed to be the place Lord Shiva and Parvati got married. We shall visit the temple and after it trek to Sonprayag. Today, we will little before Gaurikund, near the river. Meals and overnight stay in the camp. In the morning, we will visit the Gaurikund temple and the hot springs. After it, we shall proceed to Kedarnath. The entire trek today is a gradual ascent till we reach Kedarnath. Arrive in Kedarnath and camp. Meals and overnight stay in the camp. We shall visit the Kedarnath Temple in the morning and after the Darshan, we will trek back to Gaurikund. Post lunch, we will be driving to Rudraprayag and check-in to a hotel. Overnight stay in the hotel. Post breakfast, we will drive down to Haridwar and from here catch AC train for Delhi at 18:05 hrs. Arrival at Delhi by 22:45 hrs. 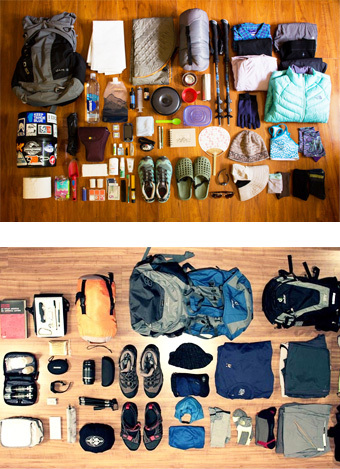 When to book Panwali Kantha Trek ? You should book Panwali Kantha Trek well in advance (at least 4 month prior) advance so that you get ample amount of time to prepare well for the trek. Our pick up and drop point for Panwali Kantha Trek is New Delhi train station at platform no. 16. We will send you the train ticket and you can board train from there to Haridwar. At Haridwar our guide will pick you from train station and then from there your tour will start. What is minimum age required for Panwali Kantha Trek ? 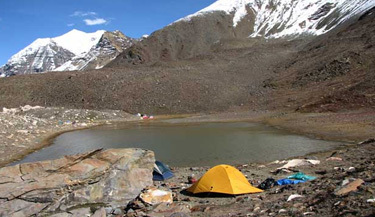 Panwali Kantha Trek is a challenging trek with a maximum altitude of 18000ft (5490m) minimum age required is 18 years. What will be the minimum temperature during Panwali Kantha Trek? 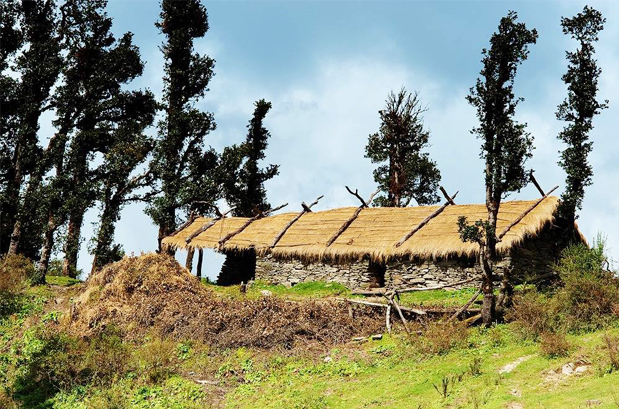 How long we trek during Panwali Kantha Trek ?